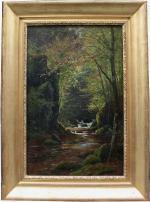 Forest painting by Victor Puhonny (1838 Praque - 1909 Baden-Baden) Studied by Georg Saal and Schützenberger. His landscapes from Schwarzwald are in the Art Hall Karlsruhe, in the Art Union Chur, in museums of Solothurn and Winterthur, in the Empress-Auguste-Bath in Baden-Baden and in the Politechnic s hool in Karlsruhe. On the occasion of his 100th anniversary of his death, the city of Baden-Baden awarded Victor Puhonny posthumously the city prize "Artist in Baden-Baden" in 2009.Puhonny often painted in the great outdoors in and around Baden-Baden. 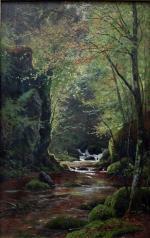 In this outdoor painting, the artist painted the object to be imaged directly, in natural light and natural environment. This form of painting is thus in contrast to the studio painting.Puhonny was in Baden-Baden as one of the pioneers of this new style of painting. Inscription: signed on the lower right edge. 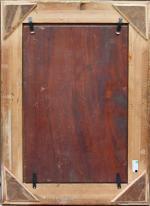 Technique: oil on mahagony wood, original period gold-plated frame. Measurements: unframed w 12 1/3" x h 19" (31,5 x 48 cm); framed w 18 1/8" x h 24 5/8" (46 x 62,5 cm).